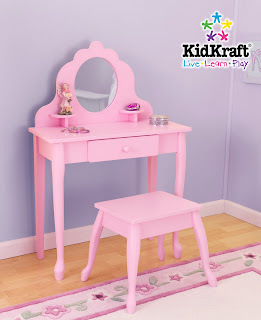 The well-known Medium Diva Vanity Table and Stool set by Kidkraft now comes in Pink! Crafted from wood, the medium sized vanity table has two shelves for displaying small treasures and a large center drawer for the diva to store her accessories. Always keeping safety in mind, the round mirror is made of shatter-proof plexi-glass. With it's Queen-Anne style legs, the KidKraft Pink Medium Diva Table and Stool Set, will make a stylish and pretty focal point for every little girl's room.